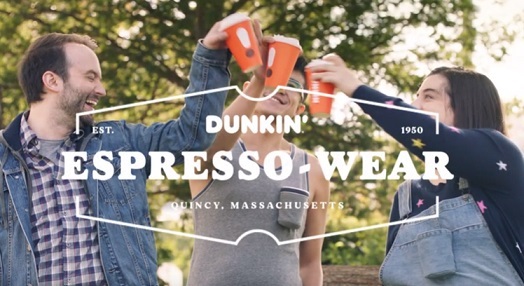 Dunkin’ showcases, in one of its latest ads, a clothing line designed for espresso lovers to help them keep their hands free and their espresso drinks close by at all times. The 80-second spot features a man holding two cappuccinos and placing them, when needed, in the pockets of his Dunkin’ Cappu-Chinos, in order to be able to carry out other activities, such as trimming a green fence, giving high-five with friends when meeting them on the street, fixing his hair, folding clothes, and opening doors for ladies whose both hands are busy. The Espresso-Wear collection also includes Americano-Veralls, which are denim overalls with two pockets adjusted for Americano coffees, and Latte-NK Top. The collection, which might definitely sparkle interest in espresso lovers, is not real, though, so they will have to stick to the drinks, for now. This spot is only one out of three ads included in the brand’s new fully integrated campaign from BBDO New York, called “Sipping is Believing,” which runs across TV, radio, social and outdoor. According to the company, which recently dropped the “Donuts” from its name, the new line of handcrafted espresso drinks utilizes new, state-of-the-art espresso equipment for optimal espresso bean extraction, a new recipe for a stronger and more robust flavor profile and even a bold and bright new cup design. The line will also be promoted through sampling and specials offered by the chain.